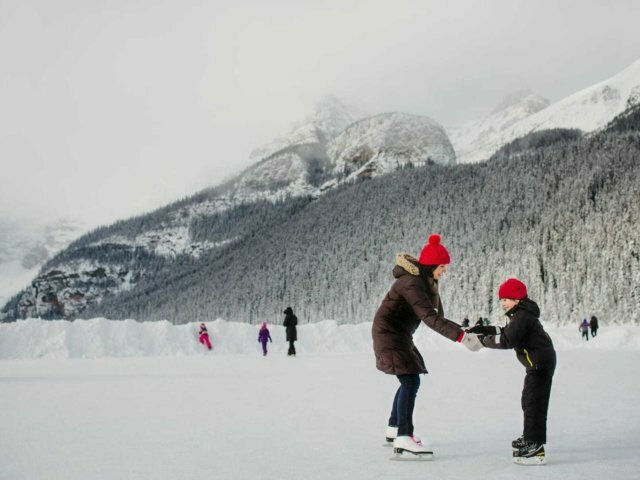 Experience the wonder and joy of winter in Lake Louise through the eyes of a child. Lake Louise is a great spot for family vacations. There are a big range of fun and safe activities to do in the winter to keep them discovering and exploring. You are in one of the top places in the world to ski, but if that's not your thing, there are plenty of other activities for family fun in the land of winter. Whether you rent skates or just shuffle your way across the frozen water, everyone is sure to have a great time! This amazing event is sure to captivate and engage the whole family with the magic of masterfully carved ice sculptures. Kingmik offers family friendly dog sled tours with 1/2 hour tours, perfect for little ones and even inexpensive rates for children under 5 who ride with an adult. Walk along the canyon to a stunning frozen waterfall where you may even see some people ice climbing. Wearing ice cleats, or rent them, (link to http://www.wmsll.com/) is part of the fun! Stand on top of Lake Louise ski area and take in the stunning 360 degree views of soaring peaks, stunning glaciers, and the unspoiled beauty of winter.